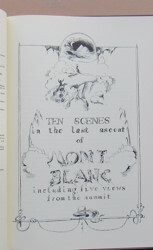 This is a quality facsimile reprint of TEN SCENES IN THE LAST ASCENT OF MONT BLANC INCLUDING FIVE VIEWS FROM THE SUMMIT by J. D. H. Browne. This book was published in Geneve by Slatkine in 1980. 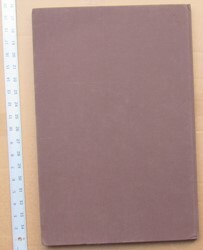 The book measures 485mm tall x 325mm, and has pages  + 16 +  + 13 + 10 leaves of color plates with blank versos. 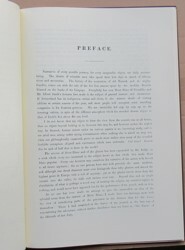 This is a high quality 1980 reprint of the classic 1853 edition which has reached sale prices over $20,000 at auction. This reprint is limited to 300 numbered copies. 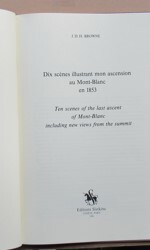 The complete English text is present along with a complete translation of the text into French. 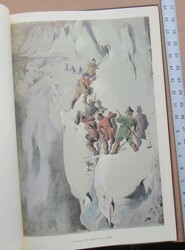 The original 1853 edition was entirely in English (no French). 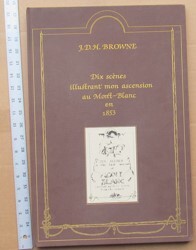 The book was originally published with the illustrations in sepia over greyish background and not colored. 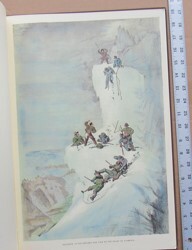 Buyers had several examples hand-colored. 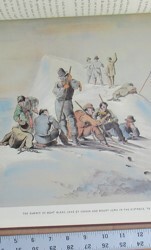 This is a reproduction of one of the hand-colored examples. The 1853 original was issued in wrappers. This reproduction is bound in brown cloth with gilt lettering and gilt border front cover with a smaller reproduction of the front cover of the 1853 wrappers inset on the front. This is a complete reproduction minus the illustrated dedication leaf. 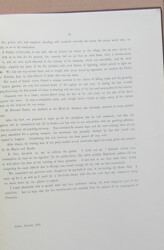 For some unknown reason the publisher of this 1980 edition did not include a reproduction of the dedication leaf, possibly because it was missing from the one used to make the reproduction. Also, the size is slightly smaller than the 1853 original, about 7cm shorter. 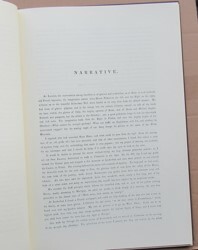 Fully complete examples of the book are rare. 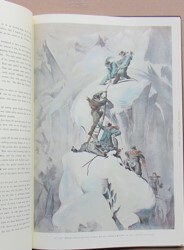 Being like Pitschner's folio of Mont Blanc that also had plates unbound, often one, two or more plates were extracted for viewing and not returned to the set. CONDITION: Original brown cloth with gilt lettering and gilt border front cover with a smaller reproduction of the front cover of the 1853 wrappers inset on the front. Small bump tip of one corner, no previous owner marks or writing on any pages, clean, no foxing, solid binding, never used (purchased directly from the publisher and kept in climate controlled storage for years), Fine Price: $500.